Under the action of water, this gel turns into a light, transparent and fresh foam, which smells like white flowers and citrus fruits. Makeup, dust, excess sebum, dead cells ...: after cleansing gel, the skin is cleansed of all its impurities. 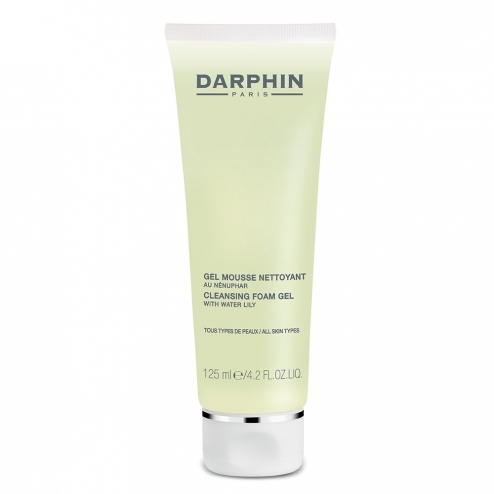 Thanks to the white water lily, this cleansing gel protects my skin while moisturizing it. Apply on wet face, then rinse with warm water. INCI formula: Water / Acqua / Water, sodium laureth sulfate, lauryl glucoside, berberis vulgaris extract, polygala senega root extract, nymphaea alba root extract, citrus grandis (grapefruit) peel oil, peg-40 hydrogenated castor oil, panthenol, hyaluronic acid, biosaccharide gum-4, tocopheryl acetate, butylene glycol, pentylene glycol, cocamidopropyl betainamide mea chloride, glyceryl oleate, lauramidopropyl betaine, coco-glucoside, peg-120 methyl glucose dioleate, ppg-26-buteth-26, polysorbate 20, hydroxypropyl guar hydroxypropyltrimonium chloride, alcohol, fragrance (fragrance), sodium chloride, tris (tetramethylhydroxypiperidinol) citrate, citric acid, tetrasodium edta, sodium citrate, limonene, hexyl cinnamal, butylphenyl methylpropional, benzyl salicylate, methylchloroisothiazolinone, methylisothiazolinone, phenoxyethanol0.